Pull up a couch. It's cool in the Lounge. Just remember to be a good neighbor. 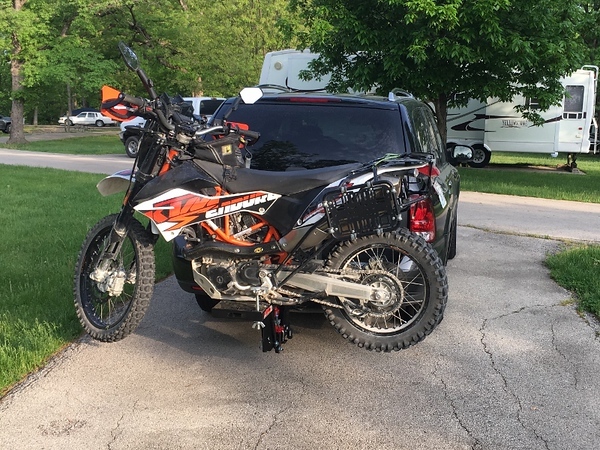 Loaded up the bike and went to John Pershing State Park in Northern MO this weekend. The Moto-Jack worked very well. What is this Pershing park you speak of? Looks to be 2.5 hours east of us, might be worth a drive? XR-Nut I've been working on a GPS track that runs from Eagleville MO to Willow Springs MO. The idea behind this track is to provide a connection from The Trans-Iowa Trail, to one of the Trans Missouri Trails that will connect to the Trans-Arkansas Trail in Blue Eye MO. I was camping at John Pershing State Park to do some additional exploration and ride a test track from John Pershing State Park to Graham Cave State Park. Unfortunately, I wasn't able to ride all that I was hoping to, so a return trip is in order to complete the final leg of the track which is from from Eagleville MO to John Pershing State Park. Pershing State Park does have some hiking trails about ten miles in total, is close to Locust Creek Covered Bridge (one of only four covered bridges left in Missouri), not too far to Marceline MO (one of Walt Disney's boyhood hometowns, with a museum located in a restored Santa Fe Railroad Depot), and of course there is the boyhood hometown of General John Pershing in nearby Laclede MO.